This model seed dehulling machine is specially designed for rapeseed hulling and kernel husk separation in the oil milling plant. The huller works by means of extrusion, shearing, twisting and tearing of the paired rolls. The kernel husk separator works by means of vibrating screens and air currents according to different bulk densities and sizes of the husks and kernels. 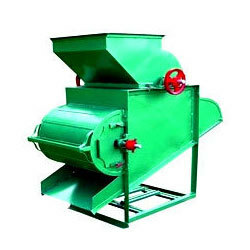 Capacity: huller: 100t/d(24h): kernel husk separator: 50t/d(24h). Husk separation rate: 90～98%(water content: 2～10%). Compact yet with a high capacity, easy to manage and less labor intensive. Utilizes a special plate screen with a reduced frequency of sceen replacement to improve the efficiency of production. The paired rolls, made of new material ADI castings, have been treated via a special process for durability. By adopting a multiple vertical air current process, circulation has been improved. Contact us now for further info about this machine, or you can see other equipments you feel interst. We are always ready to serve you!